Why Choose Lamotrigine Starter Kits? 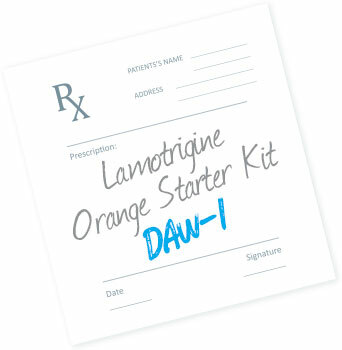 OWP offers three Starter Kits (Orange, Blue, and Green), each based on FDA-approved 5-week titration schedules, for patients initiating lamotrigine therapy. These Kits help physicians titrate their patients appropriately to the therapeutic dose, as supported by clinical studies. Lamotrigine Starter Kits may be prescribed “DAW-1” (Dispense As Written – or appropriate language required by your state) to ensure the Lamotrigine Starter Kit is received. A portion of the profits from the sale of Lamotrigine Starter Kits helps support the humanitarian work of the ROW Foundation, an organization dedicated to help bring training, diagnostics, and treatment to under-resourced communities around the world. Talk to your prescribing physician to see if a Lamotrigine Starter Kit may be right for you. If you are a patient with a prescription for a Lamotrigine Starter Kit, it can be purchased through your local pharmacy. You may also call 800-273-6729 for assistance in finding a pharmacy to fill your prescription. If you are a patient currently taking lamotrigine or you are interested in learning more about Lamotrigine Starter Kits, please visit the Lamotrigine Starter Kit Patient Page. 2Conn VS, et. al. Current Medical Research and Opinion. 2015;31:1;145-160. 3Gutierrez PM, et. al. Journal of Psychiatric Practice. 2017;23:5;320–327. 4Peterson GM, et. al. Epilepsia. 1984;25:4;412-417.